It’s been a while since I reported on any 30 day challenges, so it’s time for an update. – thankful for my wife, plus the fact that she’s a good cook. – thankful for my family. No one’s crazy and we all love each other. – thankful that an Android phone can be a powerful personal computer, and that Google Docs lets you edit a doc from Android. – thankful for my cats, but especially for the furry orange one who likes to perch on me and sleep next to me. – thankful for caffeine, which is helping me to work down my email backlog. – thankful for my health. Glad to be over my whooping cough. – thankful for an aisle seat on a plane, that the plane that landed on time, and fortuitously running into Googlers in the airport to share a cab with. But also thankful for beautiful snow in Washington D.C. that didn’t derail my travel plans. – thankful to be heading home from D.C.
– thankful for exercise and my health. And for a long bath after an eight mile hike. – thankful for sleep, but mainly because I haven’t gotten enough of it. – thankful for the chance to vent with some smart people. – thankful for Data Liberation and my lockpick set. – thankful for an empty locker room. It sounds silly, but it’s more fun to get dressed in an empty locker room than a crowded one. Okay, the stuff below was an April Fool’s joke. I’m still on the electricity! I think sometimes we get caught up in the excitement of technology and the online world. We forget that there’s an entire world offline–a world of books, and visiting with people, and being active instead of sitting in a chair. So my next 30 day challenge, I’m going to turn off my internet connection and reconnect with the offline world. I’m turning off my cell phone and won’t answer any email. Instead, I’m going to visit with friends in person, catch up with family, and generally try to use as little technology as possible. I’ll still take showers indoors, since that doesn’t need electricity, but otherwise I’ll be getting up with the sun and going to bed when it gets dark. This will be a really difficult challenge, but I’m looking forward to it. I’m heading offline after I publish this blog post, but I’ll let you know what I learned in 30 days! i love the idea & look forward to hearing how it went. hoping it’s not an april fool. 30 days without electricity? That sounds scary. However, good luck, young Matt, may the force be with you. Leaving the friki side: Congrats for your 11 year anniversary. Matt…You are truly genius! Your acts are Maverick and of course challenging… All the best Dude!! This is a pretty neat challenge. Sounds tough initially, but I bet by the end of the 30 days you will start to enjoy it. I’ve done something similar in the past. Best of luck Matt! OMG, that will be a challenge indeed Matt. 30 days without cell, no internet connection, etc. is though to beat. Would love to see how this goes. One thing though, if you can do it :), that would be a big contribution towards making the world “more” green… good luck with your challenge and hope you succeed. Making time for the offline world is something that many of us have been neglecting and that is “not good”. Thanks for sharing your interesting thoughts and good luck on you newest venture. Can not wait the 30 days to hear how it went. Love the thankful list. A great idea that we should all do every year. We get so tunnell focused on “what is important” to us that we forget the multitude of reasons we are lucky. Not too sure about camping out for the next 30 days. One to two nights of camping is enough for me. Good luck though. 30 days without electricity – this **is** an April Fools Day joke, right?? I’m thankful for Matt’s April Fools’ Day jokes! Wow, 30 days without electricity is hard-core. Good luck to you. Last month during my 30-day challenge, I ran 100 miles. Seeing that its about 6x what I normally run in a month, I thought I did alright getting through in 28 days. grateful that today is April 1st, as I don’t think I would enjoy 30 Days without Matt!…that being said, there are a lot of those offline things that I get a real kick out of. Thanks for reminding me! “- thankful for my cats, but especially for the furry orange one who likes to perch on me and sleep next to me. Try 30 days using Bing. That’s what I’m doing. Beats the pants of Google for research since Panda. I really like the idea of 30 days of things to be thankful for. With all things going on in the world today, I`m thankful to be born in the good old USA. Wow! I didn’t ever think that you, Matt, have such a great outlook on life and technologies. Linus Torvalds says that he don’t use mobile phones, ’cause it distracts from the work. After I heard this idea Torvalds became example to follow for me. This post has made you, Matt, a second example for me. a tweet by a ‘nobody’ is beating my site for a very popular term. Any advice on how to make sure my content is not shallow? Would be great if it wasn’t an April fools joke. We all should disconnect for a day or two a month. Disconnecting from 24/7 technology every now and then can do the world so much good. Doesn’t sound like an April Fool’s joke. Could be, but it’s a 30 day challenge, so it’s not really too off the wall. Matt, that’s a great idea! I have spent countless hours in front of my computer, on cell phones, playing games online. 30 days without electricity ouch that will be tough. I think most people would become grouchy after a day or two. PS are you talking cold showers? I believe gas or electricity is required to heat water, unless you got one of them solar things. Good luck that is a big challenge. Sounds perfect.The one who knows to be thankful can always have a paradise life. that’s really great adventure, i guess you can write a full blog about 30 day experience (but cannot as going in offline mode), waiting eagerly to hear from you back. My favorite was the LOCKPICK SET thankfulness. I have one, too. And, with just a little practice, I can pretty much pick any Master lock in 10 seconds, and most door locks (except those nasty double-sided 7-tumbler ones). It’s almost ridiculous how easy locks are to pick once you get good at it. And, considering how easy it is to get a pick set, it’s kinda scary. Heh, at first I believed it but then the bit about sleeping outside made me realised what day it was! Keeping one’s computer usage to a minimum would be a fairly interesting challenge though. Oh, and I love how ‘Garry’ (April 2, 2011 at 1:35 am) has posted up spam – on the main anti-spam guy’s blog. Heh. I really wonder if you are doing this challenge of staying out in your back yard! If it hadn’t been april fools day I would believe it. If you are, your lucky you get the great weather to do it. Might be another thing you can add to the thankful list. I think it’s ironic that you’re going ‘dark’ for 30 days while Google has left us in the dark about Panda. I think its high time I start doing something like this ! That’s a very impressive one Matt, for someone who works in tech. I went 3 months with minimal electricity, and internet 1 day a month, 2 years ago, and it did feel… amazing. I found I slept better, had more memorable dreams, and yes, life felt more fun. Here’s hoping you get the same out of yours. 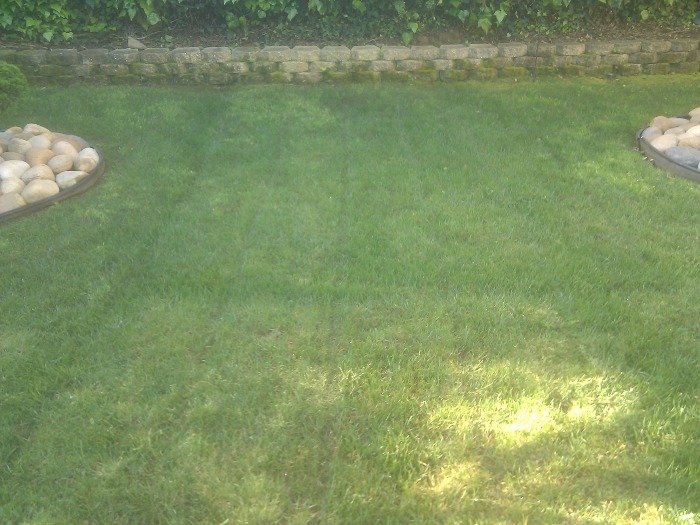 Whoa there Matt, looks like you have some ruts in your lawn. You should cut perpendicular to those for the next month or so and then rotate direction every other week. Good to be thankful. Not good to be without electricity. Ummm, escuzmeeee… being thankful that no one in your family is crazy? Crazy is an attribute we cherish in my family. Actually turning off your cell phones, email, twitter, facebook, ipads, tv, iphones, and other gadgets once in a while is a good thing. Technology is great and has a lot benefits but it’s easy to lose oneself. Must we be entertained by a glowing screen 24/7? I’ve been trying to read more books lately, get outside and turn off the gadgets when I’m not at the office. This would be a good challenge for everyone. I missed the April Fools joke as I’ve been away, but wonder about the cats. I hope they have names and you don’t talk to them “hey – orange one” or “gray one, c’mere.” Cats are cool. And so is your blog. Look forward to more posts. Really, I also want to do this thing but I think its a tough task at this time, when everyone and everything depends upon technology and electricity. that have manifested in your day to day activities? You’ve just inspired me. Tomorrow I’m starting a 30 days of gratitude challenge on my blog. I’ll take a picture of everything I’m grateful for in my life. Your 30 days w/o electricity is hilarious. You should actually go on vacation and attempt that one. Being thankful is a good characteristic of a true man. Thanks for sharing this to us. I will be doing this in a daily basis. Love it and thank you Matt! Well I guess I would also have believed it if I landed here before you edited out everything. I could do without electricity (given enough batteries) but internet? Good luck! It’s nice to see someone with integrity in charge of Google search, thanks! I know this may have been one of the least complicated 30 Day Challenges yet, but I think it’s perhaps the most powerful. Reminding yourself to be thankful for something every single day can get quickly lost in the daily doldrums. So, thank you for this list and for bringing this activity – one we can and should all attempt daily – front of mind. This is great!! To be thankful that is. To go back to days of no electricity (yes I grew up in the third world where electricity was sometimes gone for days) , well I just don’t think so!! Thank you for sharing your list. I think you have inspired me to create one of my own. It is good to take time out of a busy schedule and really be thankful for the many blessings we have, and often overlook. Great post! I would be thankful if when I searched Google for a person’s name, MyLife results didn’t dominate the search results! What’s up with that Matt??? C’Mon, we all know MyLife.com is Reunion.com with a new face… Why do their results keep topping search ? It’s not like when you click on the link you find VALID information. You only find a page asking you to pay to join. Come on, if Google want’s to seem valid with all their narrowing techniques, they need to get rid of the most obvious exploiters. It is amazing what we are used to…No electricity? I know everyone thinks how did we cope years ago? No doubt in a few hundred years when an amazing invension is made, we will all wonder how anyone coped without this, back in the year 2011!! I love that you said you’re thankful for good copy editing. As someone who has a lot of experience writing and editing copy for online sources, it’s good to know that someone on the programing / computer tech side of things understands and appreciates the work we do. Hah this is my favorite 30 day challenge so far. Don’t know how I missed it before. You laugh about going without electricity but I have been through several hurricaines and I have gone without electricity in the humid heat for several weeks. It actually can be quite relaxing. Everything seems to slow down. You hear more, you smell more. I was sure glad when it came back on though! I just watched your TED-talk and – since I am all into building habits in 30-day-challenges – immediately got hooked to the idea of not make it a must to make things stick after 30 days but also leave the fun part there: just experiment, enjoy the experience and see what happens. I know this was an April Fools joke with no electricity, but I just wanted to comment on post and tell you a funny story about no electricity and camping outside. My friends and I recently took a trip to Black Mountain, NC for my best friends Bachelor party. We thought it would be a great idea to get away and have some guy time with no connection to the outside world. Little did we know that our campsite, The Great Smoky Mountain National Forest, was wi-fi ready for all its visitors! We no longer had an excuse for not checking in with everyone, but we still managed to keep ourselves away from the technology for the weekend. It’s harder to get away then you think.